Warrior 2" Leaf Spring Perch for 2" wide leaf spring. Warrior Leaf Spring Perches are weld on for converting springs to an over axle tube application, replacing perches that have collapsed, or correcting pinion angle with out using shims. All leaf spring perches are measured in reference to spring width and sold in pairs. 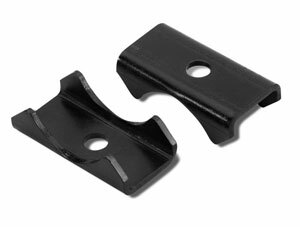 All leaf spring perches fit 3″ axle tubes and will fit other size tubes. For smaller axle tubes welding to fill in gaps is required and for larger axle tubes slight grinding of the leaf spring perch is required.